Announcing the 2019 LWVO All-City Luncheon! Make your luncheon reservation here for our 28th Annual All-City Luncheon on Thursday, April 11th! The luncheon is at 11:00am at the Oakland City Center Marriott Hotel! We hope you’ll join us - bring friends and host a table! 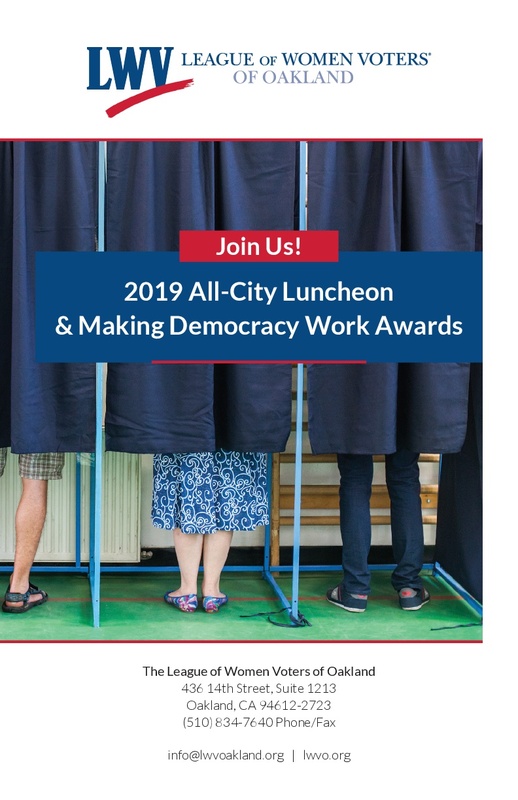 Hear our speaker, Rosie Rios, 43rd US Treasurer, and meet our 2019 Making Democracy Award Winners: Building Opportunities for Self-Sufficiency (BOSS) and New Voices Are Rising. We hope you’ll join us - bring friends, host a table - help us raise funds to publish our 2020 Oakland Easy Voter Guides in English, Spanish and Chinese. Make your luncheon reservation here! Or, print a Luncheon Response Card and mail to our office. Rosie Rios, the 43rd Treasurer of the United States, will be the keynote speaker. Ms. Rios, who as US Treasurer was instrumental in leading the effort to have a woman’s face on US currency (Harriet Tubman will replace Andrew Jackson on the $20 bill), was raised in Northern California and spent time working here in the Bay Area. Read more about Rosie! Consider Pledging a Luncheon Table! This is a popular event which brings together Oakland’s business, education, labor, political and civic leaders in support of our city and the League’s activities. Have your name listed in our Luncheon invitations, mailed to thousands of the East Bay's most influential companies, organizations, and individuals. Your Luncheon Table Pledge will make possible the production of our Oakland Easy Voter Guide, Who Represents Oakland and the videos that have been so effective in educating Oakland voters. We will be providing election information for the Presidential and local elections, helping to make the census count fair and complete, supporting reform of Proposition 13 to improve California’s education system, and, last but not least, celebrating the 100th anniversary of the founding of the League of Women Voters. Our All-City Luncheon is our primary fundraiser and in 2019 we will have plenty of work on our hands. Join us in ensuring that Oakland Votes Informed by hosting a table at our All-City Luncheon.